The AptoFluency blended solution is the most highly-differentiated of its kind in the language training industry. 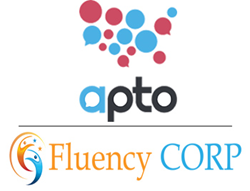 Cultural-linguistic training company Apto, and Fluency Corp, a leading language training firm, announce today a channel partnership to offer a fully blended learning solution. The new offering allows learners to interact with real-world, video-based scenarios as well as live instructors for face-to-face training. The blended solution will be part of Apto’s cultural-linguistic training program known as “AptoFluency.” The partnership enhances Apto’s offering, particularly for employees and their families who have relocated to the U.S., and need face to face, customized instruction. AptoFluency is ideal for employers with multiple locations across the U.S. and offers localized instructors in more than 200 cities and growing. Current corporate training practice provides either e-learning as a stand-alone program that is under-utilized or in-person training that does not provide the desired sustainability and convenience of learning any time and anywhere. Research shows the optimal learning environment for preparing employees to work in complex cultures requires a blended approach. The evaluation of evidence-based practices concluded that a combination of online and in-person instruction is the most effective process for developing sustainable talent, improving cultural knowledge and communicative skills, not to mention heightened daily performance. Fluency Corp has 10 years of experience in language training and clients include Hitachi, Kayak, Google, Samsung and Southwest Airlines. The company is a certified MBE/WBE, 8(a) and HUB enterprise. Learners can sign up for AptoFluency at aptoglobal.com or fluencycorp.com. Apto is the first online scenario-based cultural-linguistic training platform to prepare internationals and their families to relocate all across the U.S. A comprehensive and immersive learning solution, Apto users learn based on their country of origin and local destination. Apto is offered in Japanese, Mandarin, Arabic, Spanish, and more based on market demand. Apto works with clients including American Yazaki Corporation and Mitsubishi Polysilicon to provide cultural-linguistic training. The heart of Apto is where culture and language meet to create community. Learn more at http://www.aptoglobal.com. Fluency Corp is an international woman-owned business with clients in Japan, Mexico, the US and Argentina. Fluency Corp is a leading provider of the highest quality language instructors and fluency-driven Bellieu Method specifically for corporations. Fluency Corp delivers effective language training for global clients ranging from Google, Intel, Hyatt and Samsung. Visit http://www.fluencycorp.com to learn more.